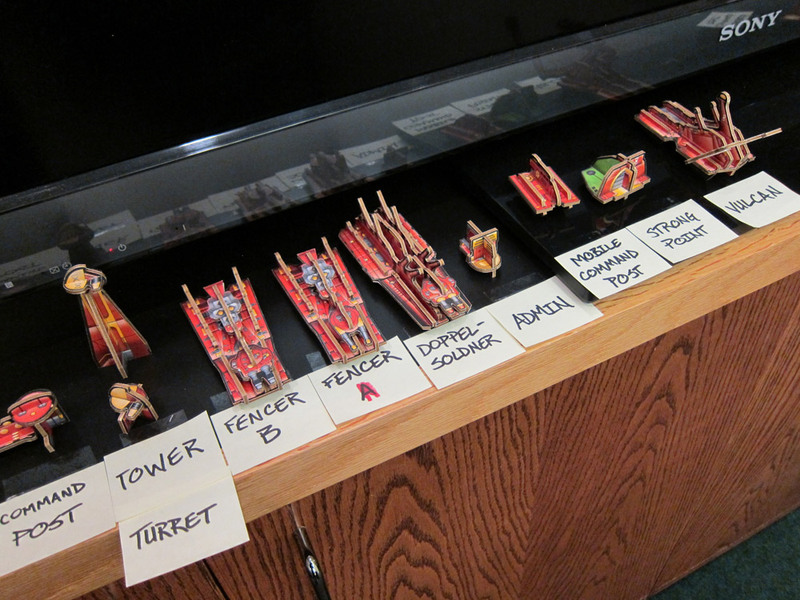 Lots of Ogre components are coming together, and every day they take over more of the office. Here's the Wall of Counters. Actually, this is just half of the Wall of Counters. 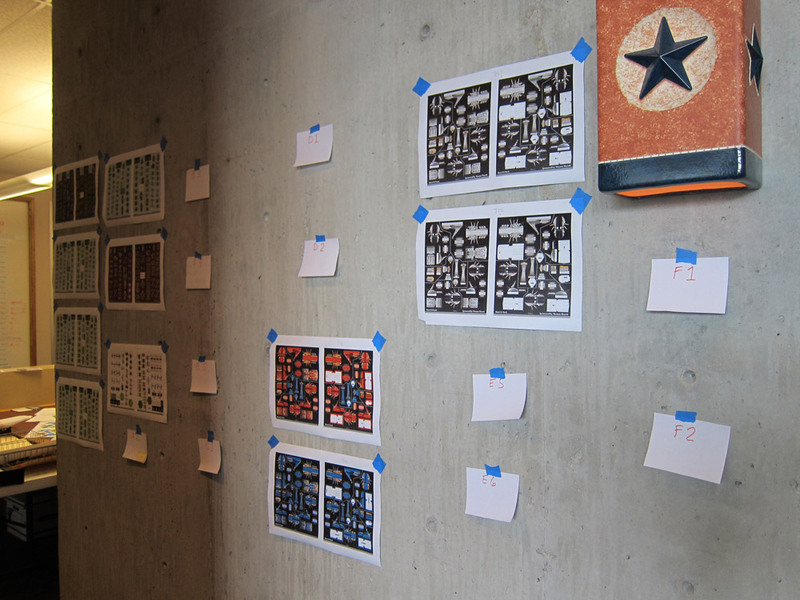 These are reduced-size printouts of the finished counter sheets, front and back. The small tags represent counter sheets that aren't laid out yet. We have a ways to go . . . On the other hand, Ben finished another sheet right after I took this picture. Every little bit helps. Here's a small part of the Shelf of 3D Stuff. These are full-size constructed prototypes. They have two purposes: for reference, and for being very cool to look at. That's the Vulcan at the right end of the line, and I see that this picture does no justice to its Huge Grabby Arms. So we'll take another one soon. Huge Grabby Arms for the win! And here's the Table of Maps. On the right is a single full-sized prototype; to be completely honest, it's the ONLY one that we have built as a full prototype yet, because it showed us a glitch that we then went back to correct in all the map images. 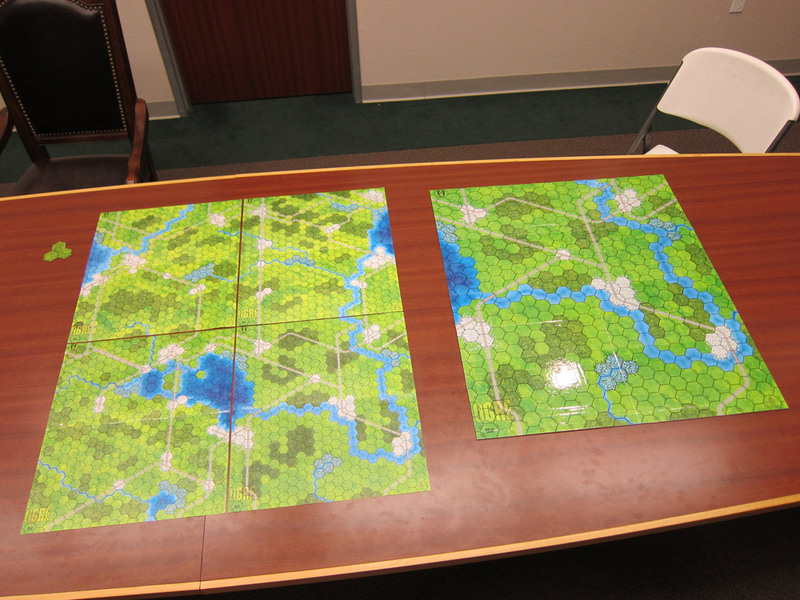 On the left are just-over-half-scale printouts of all four of the green maps, showing one of the 3.7 jillion ways that they link together to create a humongous gameboard.